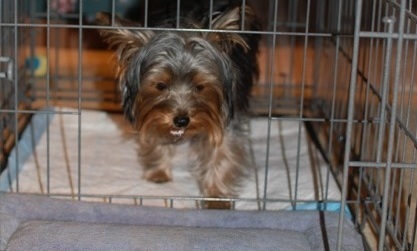 How to potty train a glen of imaal terrier puppy with the Potty Training Puppy Apartment crate. We have glen of imaal house training solutions, so housebreaking glen of imaal puppies will be fast and easy. Over 50,000 dogs have been successfully potty trained with our world-famous indoor dog potty, called the Potty Training Puppy Apartment, including glen of imaals. The free video below is a short version of our free 15-minute video which is located on our Home Page. The training techniques and tips are being demonstrated by Miniature Pinscher puppies, however, the techniques are exactly the same for a glen of imaal puppy or a glen of imaal adult dog. If you are seeking glen of imaal puppies for sale or adoption, please visit our Breeders page. At the bottom half of this page is specific breed information about the temperament and traits of a glen of imaal. If this breed is available in a teacup, toy or miniature size it will be mentioned below. Longer than tall, the Glen's short, bowed front legs, well-muscled loin, rising topline and strong rear allow it to dig and then get adequate leverage to back out of a hole dragging a struggling badger that might weigh more than the Glen itself. The medium-length outercoat is harsh with a soft undercoat, and is less prone to mat or catch burrs than a longer, softer coat. The strong tail provides a sturdy handle for pulling the Glen from a hole. Unlike most terriers, barking while working is discouraged. This is a working terrier that has not sacrificed form for fashion. A big dog on short legs, the Glen is a dog of big ideas that's never short of ways to achieve them. This is a spirited, inquisitive, courageous breed, always ready for a game or a hunt. Less excitable than most terriers, it is nonetheless an active dog. However, once given its daily dose of activity, it is content to snuggle by your side. At home the Glen is good-natured and gentle with family members; with its childlike exuberance, it especially enjoys the companionship of children. Some Glens can be dog aggressive. Glens learn quickly but may not always do what you ask. They are not inclined to bark much. The Glen is large enough to take part in almost any family activity, and small enough to take almost anywhere. It deals well with inclement weather, but is not a fan of hot weather. Regardless, it should live inside with the family. It wants to be wherever its people are, and may go to great efforts to join them. The Glen tends to stay around on walks, but because it tends to be fearless in the face of oncoming automobiles or threatening dogs, and loves a good hunt on fresh scent or a good chase, it should not be allowed off lead unsupervised. Glens are not usually great swimmers, and shouldn't be allowed near deep water until you know they can swim. The coat needs stripping a few times a year, but is otherwise easily maintained. Ireland is a land known for its lush vistas, but not all of Ireland is cloaked in emerald. The Glen area, in County Wicklow, is a bleak land strewn with rocks in which people toil to make a meager living. But Ireland is also a land known for its terriers and its leprechauns, and the Glen area has its own special magical terrier: the Glen of Imaal Terrier. In this harsh land, a dog had to earn its keep. The plucky terriers did so by tackling rats, badgers and foxes, entertaining the men by fighting in the pits by night, and working for the women as turnspit dogs by day. Here was a dog with courage to face off against a badger underground and the stamina to run for mile after mile in a turnspit of a hot kitchen. On top of that, the Glen of Imaal Terrier had a sparkling personality that made it part of the family. Some say only a leprechaun could emerge from such a past with such a rosy attitude. Very few turnspit breeds survived into the 20th century, partly because they weren't deemed illustrious or intriguing enough to preserve or develop through dog shows. The Glen of Imaal Terrier was largely bypassed in the rush to promote new breeds, allowing it to retain its natural traits, rather than evolve into a fashion plate. In 1934, it became one of the first terrier breeds recognized by the Irish Kennel Club. Most Glen shows required a working certificate in which the dog had to follow and extricate a badger in a maze of tunnels, keeping quiet all the while. It wasn't until the 1980s that a concerted effort was made to foster the breed in America. The Glen of Imaal Terrier Club of America was formed in 1986, and the AKC admitted the breed to the Miscellaneous class in 2001. It became a full-fledged member of the Terrier Group in 2004.